At the beginning of the 20th century, most business were traditional street-side businesses, who interacted with customers face-to-face. During this time mail, telemarketing, print media, and trade shows were the dominant advertising media. As technology evolved, radio broadcasting gave way to mono-coloured television, around which families loved to gather. Abruptly, image and video became a primary medium of advertising for businesses. This expansion of technology caused chaos in the business and advertising world. The use of marketing departments grew to be essential for helping businesses navigate the media world, effectively communicate their concepts, and responsively listen to customer needs and wants. A decade later, the internet exploded into everyone’s consciousness, and the concept of “social media” arose. Social media refers to the various online platforms where people come together and connect to each other, and to interact using different components specific to that platform. At present, the six most commonly used social media for business advertising and public involvement are (1) Facebook, (2) Instagram, (3) YouTube, (4) Twitter, (5) Pinterest, and (6) LinkedIn. If an organisation wants to be an active part of their customer ‘s community, to listen to their wants and needs, and to provide an industry leading perspective, then they need the use of social media. However, to know when to use what digital medium, organisations must first identify their target audience, their demographics, and their chosen platforms. From this data, we see that multiple platforms may be used to reach out to the target market groups. For instance, Instagram and Twitter can be used to pull in younger generations. Facebook and LinkedIn can be used to connect to people who are in their middle age and are more experienced in their fields. Pinterest and Instagram attract more women than men, although Instagram boasts of more frequent engagement than Pinterest. Further, we find evidence in this report to affirm an assumption that social media sites are not always trending – user growth may be holding steady or declining. For example, LinkedIn experienced a decline in users between 2014 and 2015, yet has since increased to show a net gain in users between 2014 and 2016. Twitter, has held steady for the past three years, while Instagram emerges as the fasted-growing platform, second only to Facebook. Similarly, prior to 2015, Facebook saw little net growth in its user base. However, between 2015 and 2016, Facebook sees the highest rate of growth users across all social-media platforms. Posting about the use of new technology, writing articles about innovative processes, and demonstrating how their projects serve their customers are some example of how these organisations may use social media. However, organisations should use social media not only to inform, but also to listen and to capture their customers’ needs and wants. The use of social media can help an organisation sense and respond to their customer’s environment. For government contracting agencies, we identify three potential and existing customer groups: (1) clients, (2) business partners, and (3) talent. To reach out to these customers, knowing where to reach which target audience is vital. Industry-leading contracting and research organisations, such as Lockheed Martin Corporation, Northrop Grumman, and Deloitte all use social-media platforms like Facebook, Instagram, Twitter, LinkedIn and YouTube, daily. Their existing and potential customers include Navy, Army, and other DoD agencies; technology vendors and sub-contractors; and millennial interns and new graduates. For these organisations, social media is a way to receive and respond to their customers’ needs. While the message remains the same across platforms, the use medium to convey this message to a target groups is highly dynamic. In this section, we explore several unique examples, which serve to model mature and imaginative social media engagement. Deloitte is a research company who actively contributes knowledge to their industry. Not only do they contribute a leading perspective, they actively engage and listen to their customers. Early in August, Deloitte creatively used Instagram “stories” to capture the attention of millennial females. Deloitte also posted the same video to Twitter, which served to inform a separate audience of this activity. Since they were trying to reach a target market of millennials, they used a millennial-preferred platform, in a native-millennial way. Their subtle use of “filters” in the story medium helped to integrate their message with the platform’s preferred medium, which resulted in an abundance of community likes. As an industry-leading contracting company, it is essential for Lockheed Martin (LHM) to be active in their community in order to attract customers and talent. LHM publishes a professional blog to inform their potential and existing customers of their capabilities. In their Stories of Innovation publication, they bring forward industry-relevant knowledge about the benefits and applications of emerging technologies. Like Deloitte, Lockheed utilizes Instagram to reach out to a younger audience. By posting pictures and videos of their interns, who explain how the corporation helps to further their goals, LHM uses this platform to connect to the next wave of potential hires. Northrop Grumman (NGC) represents a leading voice in the world of defense contracting companies. NGC effectively wields its social media strategy to connect to their specific audiences across a variety of platforms. As with Lockheed Martin, NGC publishes a professional blog, in which they talk about new and existing technology, and how emerging trends may be strategically applied throughout both commercial and government sectors. NGC also maintains a YouTube channel where they post a series of episodes. Each episode features an existing employee, who discusses their experiences and “lessons learned” with Northrop Grumman. Our team proposes the following strategic model, which may help guide an emerging business to mature its social-media capability. Whereas the premier objective is simply to exist, each subsequent stage increases both the relevance of the message and the complexity of the required approach. In this way, simply (1) existing in the social-media realm quickly escalates (2) to participation, (3) to contribution, (4) to industry leadership, and (5) to market disruption. Likewise, both the quality and the quantity of the level of social-media engagement to convey a message to an audience increases the complexity of the marketing approach. The organisation moves from push scheduling of posts and re-posts across all platforms, to a targeted and tailored application of each medium as a unique message. For the purposes of this article, we limit our scope to the first three of five identified stages of social-media maturity. The first stage is all about simply existing within the gargantuan pool of competing organisations. In this stage, small businesses usually have one person – i.e. the token millennial intern – who oversees social-media site activities. Typically, the stage-one organisations establish a company profile across the more iconic social-media platforms (Facebook, LinkedIn and Twitter). A stage-one organisation is just beginning to “follow” industry-relevant businesses and groups; however, their participation is largely limited to ad-hoc “likes” and “re-posts” of relevant articles. For this reason, the first level of social-media maturity may be characterised as a dis-jointed, and highly entropic state of potential meaning. Within stage two, the goal shifts to one of increased participation, where social media is a means of attracting people to the organization and its efforts. Within a stage-two organization, a handful of dedicated administrators should manage engagement by re-posts and commentary, these two are highly preferred over “likes”. A message of being active should be visible across all social media platforms. Original content like daily blog posts or interacting with other businesses through the social media platforms help to increase daily activity. In this stage, the business is both alive and is reaching out to connect to its potential and existing customers. With the goal of contributing relevance, stage three is a very important step towards developing a leading voice. During this stage, the entire organisation works to create content that is targeted towards both industry and customer needs and wants. Targeted content may include the promotion of events and current projects, and the tailored use of social media platforms themselves as a medium reaching select demographics. Engaging in dialogue by both initiating and responding to comments is also an important aspect of this stage – engagement sends a message of care and responsibility to the organisation’s community of followers. 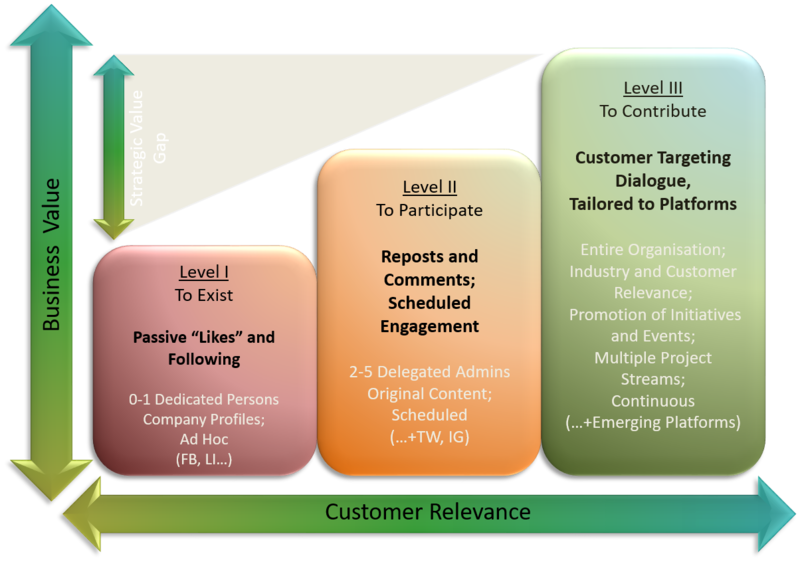 To mature from the first, ad-hoc stage of social-media maturity to the second intentional stage, the organization must extend social-media engagement efforts across all business areas, where delegated leaders are together chipping in towards improvement. Another big aspect to this is to define the customer(s). Defining the customer helps determine which social media platform to use to get in closest proximity, reaching toward that customer. Finally, expanding engagement across social media platforms is highly important to be relevant and for potential customers or business partners. Passive “following” and “liking” must give way to re-posts with original comments, and direct comments/replies. To ascend from the second, participatory stage of social-media maturity ladder, to the third stage of producing relevant contribution, the entire organisation must now engage in a single strategy. Multiple content developers are needed to engage audiences across all popular social-media platforms for an organisation to climb from passive listening to active responding. Liking, re-tweeting, sharing, or commenting on other businesses’ content are actions that serve more to filter information, and which fail to sufficiently reach potential customers. Instead, promoting capabilities through engagement with followers can help become expert in this stage and focus on the upcoming steps to social media success. Developing a strategy that determines which platforms (1) to use to promote different projects, initiatives or events, (2) to target market-demographic areas, and (3) to develop specific content media will help an organisation to establish a baseline for contributing relevance to its customers.